Brian Francis Johnson (born 5 October 1947) is an English singer and songwriter. 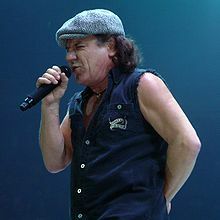 In 1980, he became the third lead singer of the Australian rock band AC/DC, after the death of their second lead singer Bon Scott. He and the rest of the band were inducted into the Rock and Roll Hall of Fame in 2003. In March 2016, Johnson stepped down from touring on the Rock or Bust World Tour due to hearing problems. On 20 May 2016, Johnson stated in an interview, "I've had a pretty good run" in AC/DC and implied that he might not be returning by saying, "I'm just thankful, really, that I came out of it in one piece.